Armadillo Troubles - Pest Control Alabama | Bama Exterminating Company Inc.
Those who do not live in areas populated by armadillos don’t have the experience necessary to know how much of a nuisance they can actually be. 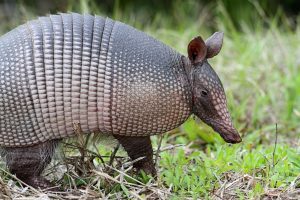 Here at Bama Exterminating Co. we understand that while armadillos are truly unique creatures, they can cause frustration for homeowners, gardeners, and farmers. One important thing to keep in mind about armadillos is that they don’t exist purely to destroy your lawn or garden. What is actually happening when they burrow and tunnel through your once immaculate yard, is that they are searching for food. To find tasty grubs and bugs, the armadillo uses its claws to break through and remove dirt and soil. While the digging is a nuisance due to the 3-5 inch deep holes they leave behind, the lawn itself suffers no permanent damage. Vegetable gardens are relatively safe as well since the armadillo is not after the veggies themselves, but rather the beetles and bugs that also live in the garden. The best method for controlling armadillos on your property is to keep them off of it in the first place. This is usually the most inexpensive method of pest control as well. Extend fencing at least a foot into the ground so that the armadillos can’t burrow underneath it. You can also use scent to repel the digging creatures as they have quite sensitive noses. If you already have a den of armadillos living on your property or wreaking havoc in your garden, you have a couple options when considering how to remove them. While there are certainly ways to do this on your own, many methods end up being ineffective and can be potentially costly. That’s why it is best to trust the professionals. Here at Bama Exterminating Co. our Animal Control and Exclusion Services are designed to protect you, your family, and your property from pests. We not only remove the animals, but we also provide a plan to control them and prevent future problems. Contact us today for more information about our pest control and wildlife management services!